'Let's Talk!' host and supermodel-philanthropist Natalia Vodianova at the opening of the panel discussions. ANTALYA, Turkey – The first global “Let’s Talk!” event hosted by supermodel-philanthropist Natalia Vodianova celebrated outstanding champions in the struggle against taboos and stigma around women’s health. It also generated several new pledges aimed at creating an environment in which women and girls can live free from shame, exclusion and discrimination. “Stigma and taboos around female health are deeply rooted in our cultures and held there with such an overwhelming power,” Ms. Vodianova said at the opening of the event organized on 25-26 October 2018 by the digital charitable giving platform Elbi and UNFPA. Galvanizing action on dismantling these taboos and advancing women’s health and gender equality was the goal of the high-level symposium. 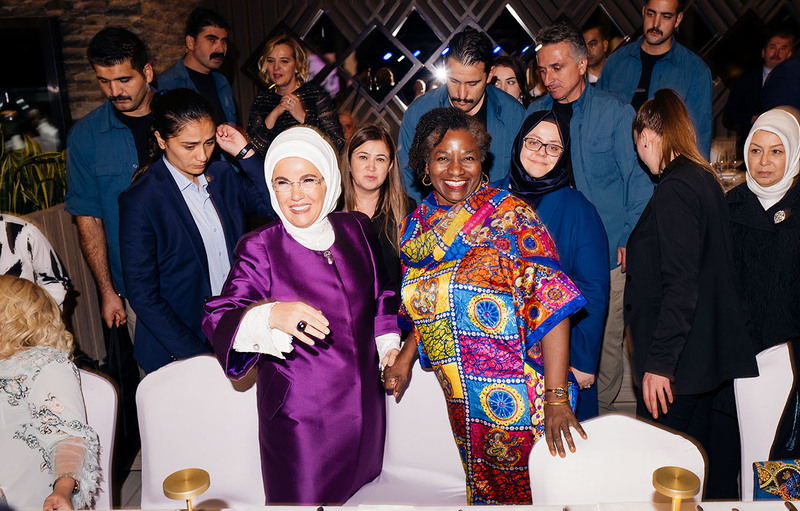 More than 200 change-makers, policy-shapers and influencers from a wide range of different sectors – fashion and politics, sports and civil society, tech and media – gathered in Antalya, Turkey to showcase successes and commit to further progress. “This first global Let’s Talk! event has been a resounding success,” said Alanna Armitage, UNFPA’s Regional Director for Eastern Europe and Central Asia. A number of prominent fashion icons were among the participants, including sexuality education champion Anja Rubik from Poland, British model and “Gurls Talk” founder Adwoa Aboah, and Burak Çakmak, Dean of Fashion at Parsons School of Design and innovative thinker on the social impact of fashion. Dayle Haddon, model and adviser to Canada’s Prime Minister Justin Trudeau, and Seda Domaniç, editor-in-chief of Vogue Turkey, also spoke at the event. A number of concrete new pledges were made at the event. The popular period tracker and women’s health app, Flo, announced that it will give UNFPA access to funds raised from its 40- million-strong user community to educate women and girls in India about their health and improve access to menstrual hygiene products. Ayça Turgay of Procter & Gamble Turkey announced a new Orkid/Always campaign, #KeepGirlsInSchool, aimed at empowering girls in Turkey through puberty education, and the donation of up to 4 million sanitary pads for girls in need. 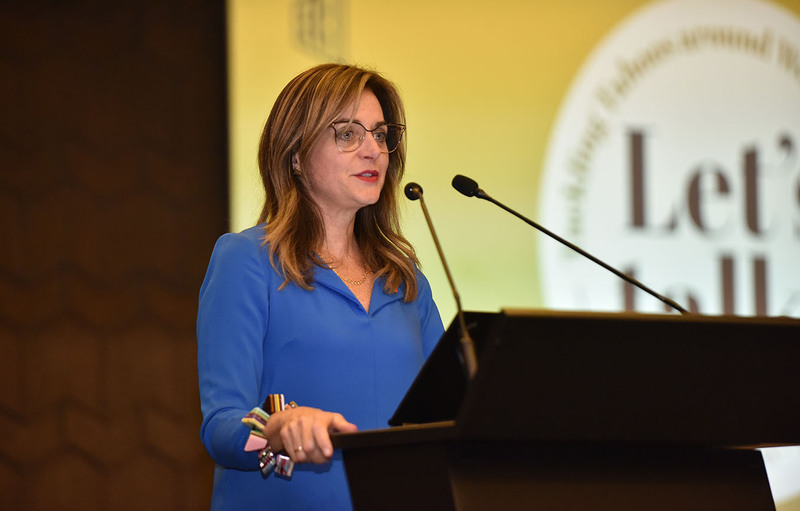 The Assistant Minister of Health of Serbia, Danijela Urosevic, expressed her commitment to introduce sustainable sexuality education from an early age in Serbia’s school system. Yuriy Sviridov of Football Club Shakhtar Donetsk committed to creating the club’s first girls’ team. The event culminated in a ceremony to present the “Let’s Talk” awards for outstanding achievements in tackling stigma and taboos around women’s health. Turkey’s First Lady, Emine Erdoğan, opened the ceremony, saying that there can be no tolerance for violence against women and expressing Turkey’s commitment to combatting child marriage. The personalities awarded at the ceremony included Dr. Nagham Nawzat Hasan, a Yezidi gynaecologist and provider of support to sexual violence survivors in Iraq, Dilek Sabancı, a prominent businesswoman and founder of Special Olympics Turkey, and Aleksandra Chichikova, Miss Wheelchair World and promoter of sexual and reproductive health for women with disabilities in Belarus. Azra Akın, former Miss World and reproductive health champion, and Dr. Zeynep Şimşek, professor and activist on reproductive health of refugees and migrant workers, were also among the awardees. “I’m delighted that ’Let’s Talk!’ has become such an important component of the growing global movement to dismantle taboos and stigma around women’s health and enable women and girls to shape their lives free from discrimination, fear and shame,” UNFPA Regional Director Armitage said after the event. The event was made possible with generous support from sponsors including Maxx Royal Resorts, which generously provided the venue at no cost, and Turkish Airlines, the Association of Turkish Travel Agencies (TURSAB), Special Olympics, Procter & Gamble Turkey, Vogue Turkey, Flo, NTV, Lazzoni, and Sterling Media. For additional perspectives on the “Let’s Talk!” event, check out Elbi’s summary, Natalia Vodianova’s Instagram highlights, and panelist Dr. Lina Abirafeh’s blog post.